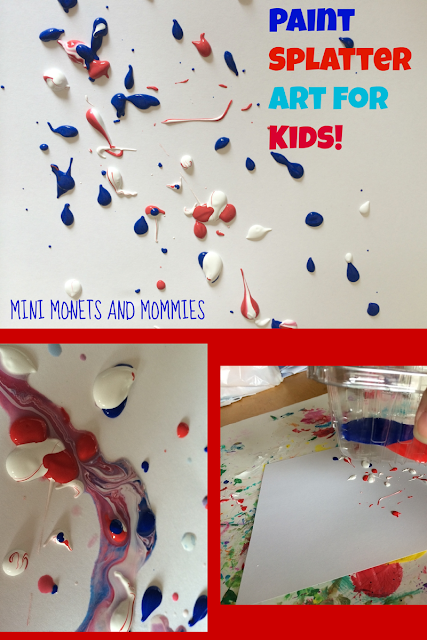 Whether it's Memorial Day, Fourth of July or your child just wants to get patriotic, this easy art activity is perfect! We've used empty plastic strawberry containers to make abstract splatter artwork (think Jackson Pollock). This time I’m trying the same thing, but with an all-American red, white and blue theme. ’ve done the good old paintbrush splatter art with my son when he was younger as well as more times than I can remember while teaching kids’ art classes. Instead of rehashing the same activity, this mixes things up a bit and gets your child thinking about new ways to make art. I have an overabundance of berry containers (the clear plastic kind that have lids and a few holes on the sides) sitting around. This summer I’ve decided to try swapping out the cookies and chips for strawberries and blueberries (my 12-year-old is not happy about that). Instead of tossing the mass amounts of empty containers, I’m turning them into crafting materials. 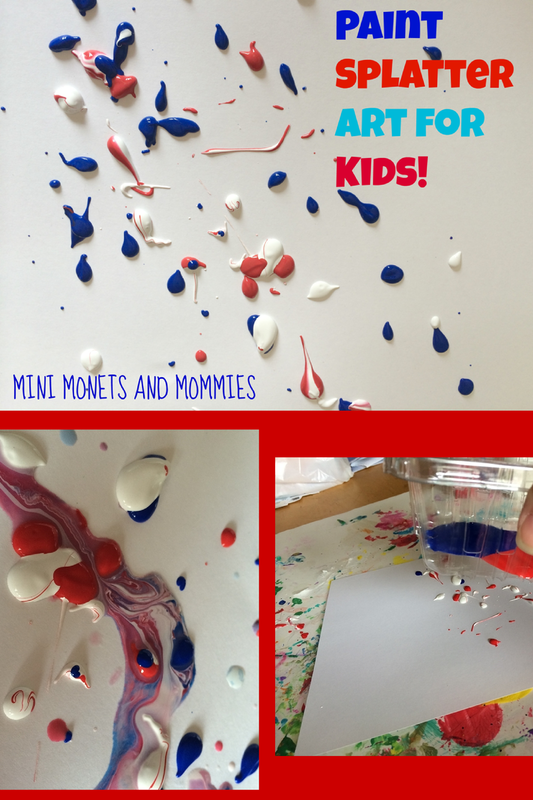 So, prep for the mess (I mean it – the paint will go everywhere) and let your little artist splatter her way to a firework-like Fourth of July creation! Add a music and movement component to this activity and put on some patriotic tunes in the background (Yankee Doodle, America the Beautiful, the Star Spangled Banner, etc.). Have your child shake the paint on to the paper to the beat. · A plastic fruit container that has a lid and holes in the bottom. 1. Prepare your work area. Cover anything that you don’t want to get messy. If you’re not entirely sure to keep things at least somewhat clean, I have a post on a few different ways to prepare for children’s art activities. 2. 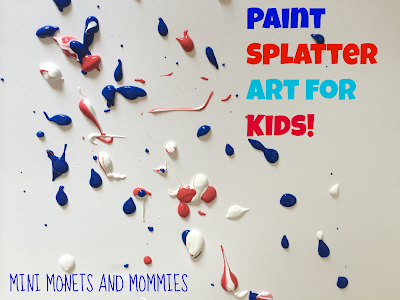 Pour quarter-sized dollops of red, white and blue paints into the bottom of the container. 3. Place a piece of paper on the work surface. Use card stock, construction paper, poster board or any other paper that you have on hand. 4. Close the lid to the container. Let your child shake, shimmy and splatter the paint all over the paper. 5. Optional: Add some special sparkle with red, silver and blue glitter. Your child can put the glitter into the paint splatter box contraption or sprinkle it right on to the painted paper surface. If the paint is too thick to come out of the holes, add a few drops of water. The watery temperas will splatter out in a swirling stream of colors. Are you looking for more art activities that your child can try? Check out the Mini Monets and Mommies Facebook page or visit and follow me on Pinterest for ideas! what a great activity!! Thanks for linking up to Stumble Into The Weekend!! Have a great one! Oh, this looks like it would be so much fun. Hope you have a great day!